If you look up Melbourne on Tripadvisor.com, the Great Ocean Road pops at the very first position. The drive along the GOR is a very popular one, offering stunning views. What I didn't know was that the GOR is the world's largest war memorial! Dedicated to soldiers killed during WWI, it was built by about 3000 returned soldiers between 1919 and 1932, and stretches for about 243 km. 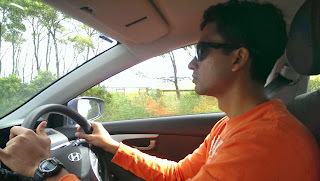 That is a very long way to drive, and initially we meant to have an overnight stop near the 12 Apostles, a collection of limestone stacks and a very popular tourist attraction. 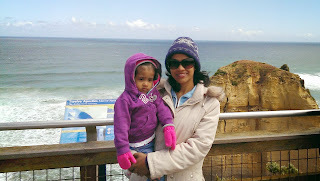 However, Viv finally decided to do the GOR drive to the apostles and back to Melbourne via the inland route in one day. We were up at the crack of dawn and left while it was still kind of dark just so we could make it back before it got too dark. Xena fell asleep again in the car, and guess what -- so did I! So yes, I missed a bit of the views because I was asleep and missed some more of them because I was busy entertaining Xena after she woke up. 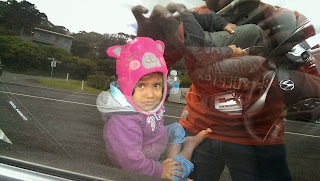 It was hard for her to stay put in the carseat as she was not at all used to such a long drive. But I did manage to catch glimpses of the ocean every now and then, and it was stunning. 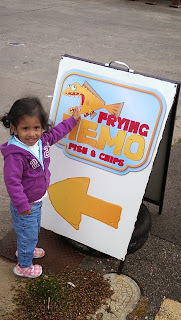 Xena was intrigued by the GPS lady and kept asking, "Aunty kya boli?" every time she spoke. When she asked me Aunty's name, I told her it was 'GPS Aunty'. Since she can't say 'G' yet, and says 'D' instead, the next time she referred to her, it sounded exactly like 'Depressed Aunty kya boli?" and I couldn't stop laughing! Viv drove... and drove... and drove some more! I found out an amusing bit of trivia about the GOR. In 1924, while the GOR was under construction, a steamboat called Casino hit a reef and got stranded. They had to jettison 500 barrels of beer and 120 cases of spirits to release the steamboat. The GOR construction workers got hold of this loot and had a two-week-long drinking break! On the way, we stopped at the Split Point lighthouse located in a small town called Aireys Inlet. Built in 1891, the 34-m high lighthouse, also known as 'the white queen' presents quite a sight. Guided tours are available but we were on a tight schedule, so we just took some photos. Our DSLR screen protector had cracked that morning, but luckily Appa had his digital camera on him so we could take photos. We also took some photos with the ocean backdrop. A nice French lady offered to take a family photo of us. After a drive of about 4 hours, we finally reached the Apostles. Xena was fascinated by these birds that liked perching on top of the parked cars. And there they were - the gigantic Apostles rising out of the ocean. The Apostles were created by the harsh wind and water that eroded the softer limestone cliffs of the mainland. This caused caves to be formed in the cliffs, which eventually became arches, and then collapsed, leaving behind only the rock stacks up to 45 metres high. 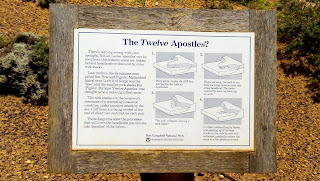 Not all 12 Apostles are still there, so there was a sign to explain why. Another close-up. Can you spot the tourists on top? Xena and I pose against the Apostles. Family shot... if only Xena had looked up and smiled! It was really cold and windy and Xena was all bundled up. There were signs that did not mince words on what could happen to you if you disregarded them. We went to the visitor centre for a toilet break and I was rather horrified to see brownish water flushing into the toilets, but this sign explained it. Xena takes a tour of the visitor centre. A red (or as she says, "LED!") helicopter! Yep, you can take a helicopter to get a top view of the Apostles. We were soon on our way back and looking for a lunch place. We stopped at this cafe for lunch. On the way back, we spotted this tiny beach and took Xena there. "Please pick me up!" She requested grandpa. It was good that we had left early as we were able to get back to Melbourne before it got too dark. It had been an exhausting day for Viv, what with driving almost 600 km. We went to bed excited about the next day - the MCG tour (for the boys) and Collingwood children's park (for the gals). And... Penguin Parade in the evening!